One of the best-known UK wooden potters, the 18.5m wooden-hulled Pen Glas SE 34 received a new lease of life recently when boat builder Bobby Cann and his staff carried out a major refit, reports Phil Lockley. 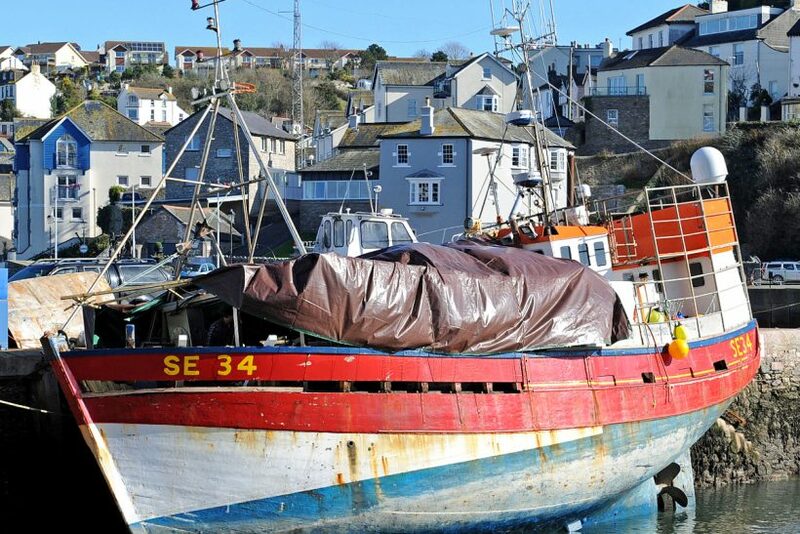 Having taken place at Brixham, the refit is a further investment from local vessel owner Waterdance Ltd. Its recent acquisition of the Pen Glas is an addition to its growing portfolio of Westcountry fishing vessels. Work carried out ‘was considerable and a pleasure to do’ said Bobby Cann, adding that his love of wood as a boat-building material continues. Admiring the construction of the Pen Glas, he explained: “The advantages of using wood are clearly seen in a boat with such a good history as the Pen Glas. Records reveal that the 18.5m Pen Glas was built in 1960, at a yard near Audierne in the region of Finistere, Brittany. Originally powered by a Baudouin DK6 engine, its open vivier tank had a capacity of 5t. Details show that over its time in France, the Pen Glas fished for langoustine, and was even rigged to fish for tuna in the Bay of Biscay. The vessel was sold in 1987, and moved to Salcombe. Bobby Cann’s team at work on Pen Glas. Alistair Moss, son of the late skipper/owner Bert Moss, is far left. Bobby Cann said, “Running from the stem, we have renewed 13 stanchions per side; we replaced covering boards, and four planks – the existing planks were not rotten but were heavily worn – and to add to the existing one, we are constructing a new refrigerated bait store. As part of that work we stiffened the forepeak floor to take a new auxiliary engine for the cooling system. “In some ways, being such a good boat has made the job more difficult. For example, all around there were stainless steel fastenings and we’ve managed to put 90% of those back, but it wasn’t an easy refit. The previous skipper and owner ‘Bert’ Moss (deceased in 2014) kept the boat in very good condition, and over the years we’ve done quite a bit of work to the Pen Glas. 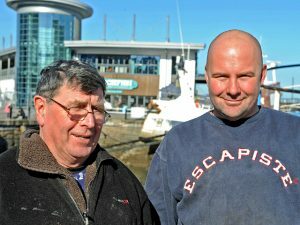 Bert’s son Alistair now works for me as a boat builder, and he contributed to the refit. “All the Breton crabbers were well-built, and far better-built than the French wooden trawlers of that day. Boats of the style that the Pen Glas is are simply first class as far as the build is concerned, and I’m told they are excellent in seakeeping. Known to many as ‘Camaret boats’, they were built at places like Douarnenez, Audierne and Camaret itself; and I don’t care what anyone says, as far as construction is concerned, the potters of that style beat the French wooden trawlers hands-down. “To say that there is a time limit on wood when it is used as a boat-building material is wrong, and I just don’t agree with such comments, which are regularly heard. “Pen Glas is well over 50 years old and is still going well. 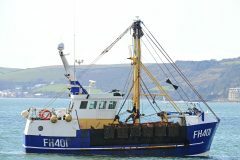 Compare that to a similar steel vessel, and you might find that it’s now nearing the end of its working life, or has already left the fishing industry. We have worked on Pen Glas before, and we understand that Waterdance has future plans for more improvements of the boat. “I believe people might shy away from having wooden boats built because they don’t understand the advantages of using wood. Largely speaking, if anything needs to be repaired or replaced on a wooden boat, it can be, bringing that boat back to being as close to good as new as possible. “Alistair Moss, Ben Fowler, Andy Savage and David Houcke, who work for me, and Ian Curtis who is self employed, are all trained properly in working with wood, and have all put in considerable time to secure long-term careers, so they must see a future in wooden boats. “I would like to think there will be new-builds in wood in the future, but the present leaning toward materials used for building new boats is 100% steel for the bigger vessels, and GRP for the inshore boats. Bobby Cann and Pen Glas skipper Dan Wooton (right). 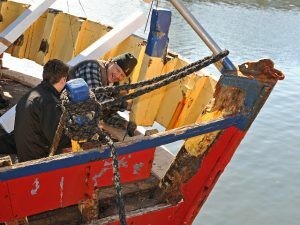 Bobby Cann reported other recent refits that his team have completed, such as the vivier-crabber, La Vagabond des Mer. “We fitted new planking in some places, and doubling boards. We replaced around one-third of the main deck and running from the bow back to the shooting ramp we fitted quite a few new stanchions on the starboard side. “On the port side we replaced seven for’ard stanchions and covering boards, and also new doubling boards (chaffing or sacrificial boards). We checked all the caulking and replaced it where necessary. It was a big refit, and I understand that the vessel has also had a new engine, new pipework and new fuel tanks.